One of the most common activities that we carry out in our cars is the engine oil change. Changing engine oil's mission to prevent burnout is subjected every minute the car engine is running. Whereas most of the engine wear occurs at start is vital that the engine oil is properly chosen to provide adequate lubrication at all times. The cold engine wear becomes between 70% and 80% of wear, this detail is that the choice of engine oil should aim to cover as first point wear on the ignition and then must maintain lubrication suitable no matter if the ambient temperature is very low, as in the mountains or cities over 1000 meters, or very high, as in the case of coastal cities. If an engine oil lubricates properly at low temperatures and at high temperatures is called multigrade oil. To be effective lubrication, the viscosity of engine oil should be low at any engine operating temperature and ambient temperature. Viscosity is defined as a facility that has a fluid-either our case engine oil, to flow over a surface. To identify whether a multigrade oil is you add the letter "W" between two numbers that specify a given oil. The letter W is for winter. For example 20W50 oil has a similar viscosity to 10 degrees Celsius to 40 degrees Celsius as, and so the oil is 20W50 multigrade. If the ambient operating temperature is low, especially in the mornings, it is advisable to use a 10W30 or 10W40. The proper selection of engine oil provides protection and lubrication to the engine but also contributes to High Performance Fuel in your car. The engine oil should be changed every 5,000 miles or every three months if the car has small paths, so you can not reach a distance of 3,000 km in three months. If the bustle of the car is in high temperature environments change of engine oil is required, otherwise the engine wear will be present in an accelerated, as the oil loses its lubricating properties at high temperatures. 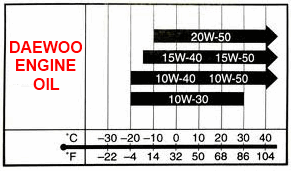 In case of frequent travel between areas of high temperature difference is advisable to use a 10W30 motor oil directly and not worry about the zone change. If the ambient operating temperature is very low, near 0 degrees or less, then you should use 5W30 oil is one to protect the engine and help overcome the problems of starting a cold engine.